Accounts accessing the SSH Server for file transfer only. Accounts accessing the server for tunneling only. Accounts accessing the server for Git access only. The main SSH Server service runs as Local System. It must run as Local System to provide login to Windows accounts. However, this also allows support for virtual accounts to run in a variety of security contexts. 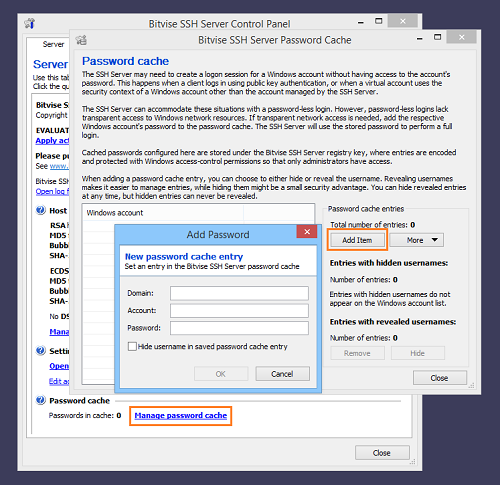 The SSH session thread that serves the connection runs in the security context of BvSsh_VirtualUsers. 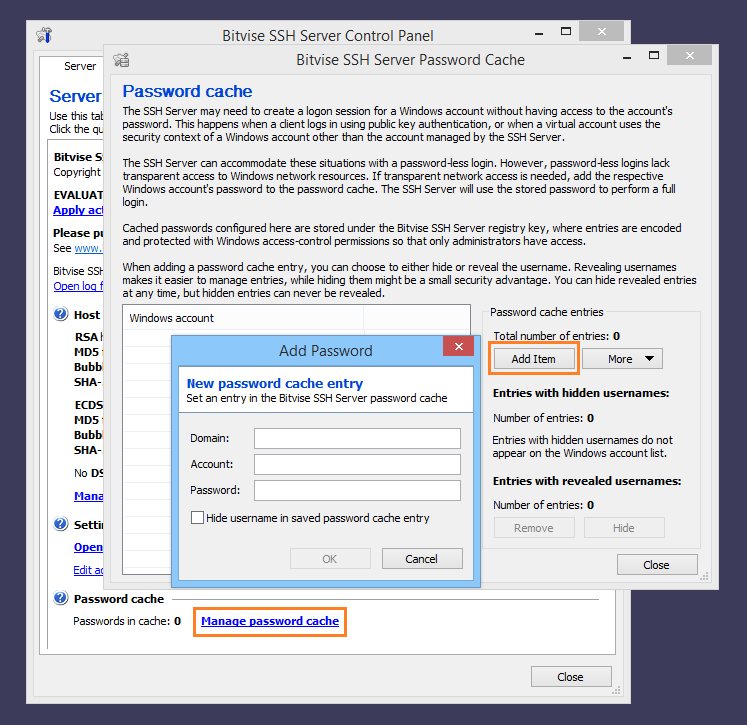 Any child process started by the SSH session runs in the security context of BvSsh_VirtualUsers. Child processes include the SSH Server's SFTP subsystem; and any terminal shell or exec requests started by the user. When logging in with a virtual account, all such processes are started in the security context of the Windows account that provides the virtual user security context, and run subject to its Windows permissions. Do not try to change the password for BvSsh_VirtualUsers. It is set to a complex random value by the SSH Server, and is reset periodically during its operation. 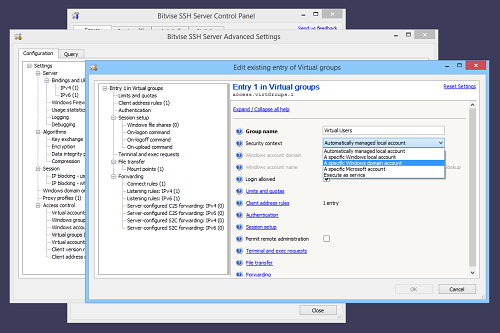 Do not delete or disable the BvSsh_VirtualUsers account. If no virtual accounts are configured, it is disabled automatically. Do ensure that BvSsh_VirtualUsers has Windows filesystem permissions needed to access files and directories that you would like virtual users to access. It is normally not necessary to change the security context for virtual accounts. However, one situation where it can be useful is when virtual accounts need to access network resources. If a network share requires a Windows domain user's credentials to access, virtual accounts can be granted this access implicitly, by configuring a domain account as their security context. This shows configuration of security context in a virtual group settings entry, as a default for multiple virtual accounts. The setting can also be configured in a virtual account settings entry, individually for that account. If you forget this step, virtual users will still be able to log in, but the SSH Server will not be able to create a logon session for this Windows account that has access to network resources, and implicit access to such resources will fail.